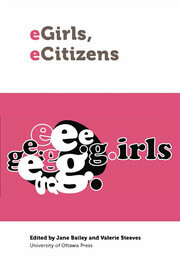 1We are grateful to the girls and young women who gave up their time to meet with eGirls Project researchers to talk about their seamlessly integrated online/offline lives and to offer their first person insights on how their equal right to eCitizenship can be enhanced. Thanks also to all of the contributors to the book and to the workshop and conference that preceded it – especially to the fabulous team of students who have supported us throughout the life of The eGirls Project, including: Sarah Heath, Trevor Milford, Virginia Lomax, Jess Warwick, Miriam Martin, Roya Baryole, Ashley Butts, Hayley Crooks, Sarah Deveau, Hannah Draper, Suzie Dunn, Claire Feltrin, Valerie Fernandes, Mouna Hanna, Jill Lewis, Stela Murrizi, Tony Verbora, Julia Williams, Nerissa Yan, Kaitlin Waechter, Anne-Dahlie Cledanor, and Emily Assaf. 2We have also benefited from the remarkable collaboration with our friends and eGirls Project co-researchers Jacquelyn Burkell, Priscilla Regan, Madelaine Saginur and Jane Tallim, as well as our organizational partners MediaSmarts, The Centre for Law, Technology and Society and the Office of the Privacy Commissioner of Canada. 3We gratefully acknowledge the financial support we received from the Social Sciences and Humanities Research Council’s Partnership Development Program and Connections Program, the Shirley Greenberg Chair for Women and the Legal Profession, the University of Ottawa, the Centre for Law Technology and Society, the Canadian Women’s Foundation, and the Law Foundation of Ontario. 4Thanks also to our dear friend and colleague Ian Kerr, for bringing us together in the On the Identity Trail Project and encouraging us to dream big. 5Thanks most of all to our families, friends and loved ones without whose patience and support none of this would be possible. The experiences, passions and critiques of our own lifelong focus groups – Val’s Sarah, Melissa, Ben, Aly and Bethany and Jane’s Helen and Grace – are at the heart of this book. Acknowledgements In : eGirls, eCitizens [en ligne]. Ottawa : Les Presses de l’Université d’Ottawa | University of Ottawa Press, 2015 (généré le 24 avril 2019). Disponible sur Internet : <http://books.openedition.org/uop/486>. ISBN : 9780776626222. Bailey, Jane, et Valerie Steeves, (dir..) “Acknowledgements”. Ottawa : Les Presses de l’Université d’Ottawa | University of Ottawa Press, 2015. (p. IX) Web. <http://books.openedition.org/uop/486>.